The Vascular Center, under the Division of Vascular Medicine of the Department of Adult Cardiology, is a dynamic multidisciplinary and service-oriented unit composed of highly specialized staff of cardiovascular medicine specialists and technologists that cater to the need of patients with vascular disorder. Its laboratory component utilizes the latest state of the art diagnostic equipment. It likewise offers a comprehensive Wound Care Clinic which is designed to tackle various kinds of vascular related lesions. It is under the supervision of the Department of Cardiovascular Surgery and Anesthesia. The referring physician remains the provider for the overall care of the patient. 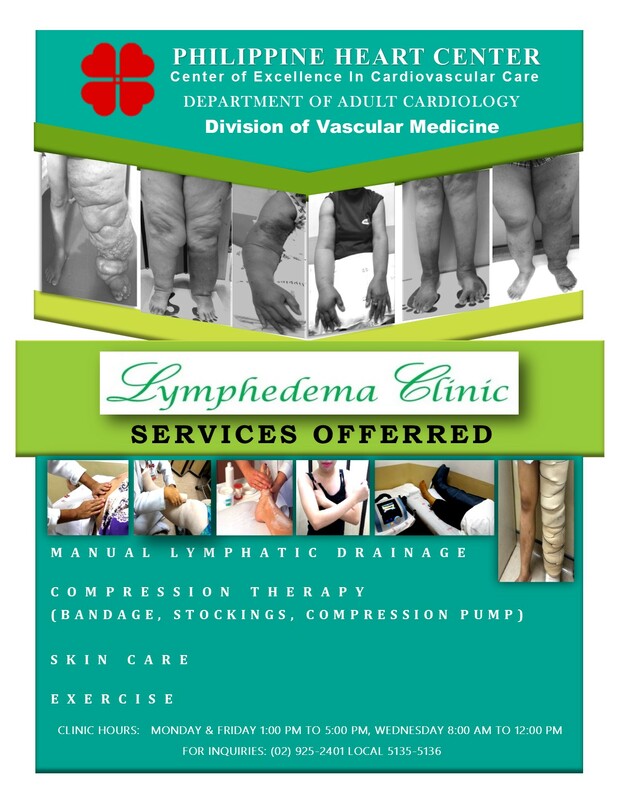 A new service of the Division of Vascular Medicine is the Lymphedema Clinic which offers Manual Lymphatic Drainage, Compression Therapy, Skin Care, and Exercise. The Vascular Center is open from 8:00 a.m. to 5:00 p.m. (Mondays to Fridays) and up to 4:00 p.m. on Saturdays. It is located at the ground floor of the Medical Arts Building (MAB) Annex. For more information, please call 925-2401 local 5135 or 5136.